Mobile business card maker Vizibility announced on Tuesday that Re/Max Regional Services, one of the real estate organization's largest franchisors in the U.S., is now offering digital business cards to its 4,500 real estate brokers and agents. Those agents are based in Georgia, Tennessee, Kentucky, Southern Ohio, and Southeastern Michigan. 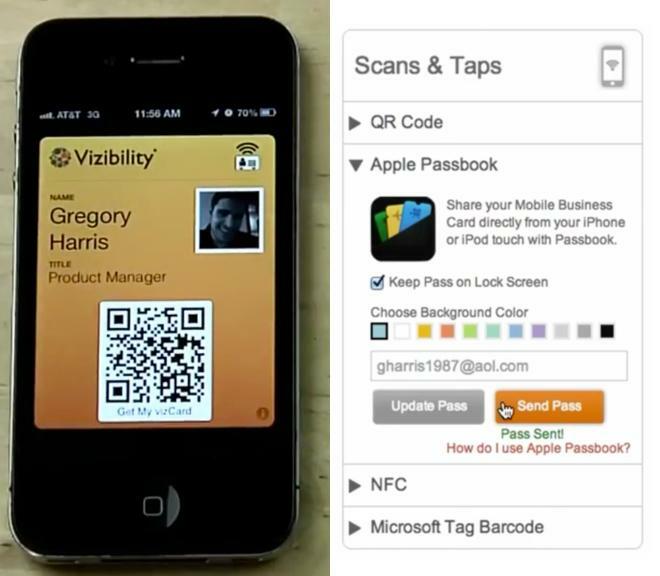 With Apple's Passbook, agents will be able to share their mobile business cards through a feature dubbed "CardSense." That will allow Passbook users to select locations where their mobile business card pass can be accessed from the iPhone lock screen. Passes featured on the iPhone include a scannable QR code. This allows anyone with a smartphone and QR code reading application to scan the code and obtain a copy of the business card. "This capability makes it a snap to share contact information at the office, trade shows, networking events, open houses, or anywhere else frequent, fast access to a Mobile Business Card is needed," Vizibility said in a press release. "Locations are set right on the back of the Pass." Vizibility claimed it is the first company to use Passbook for sharing mobile business cards, while Re/Max Regional Services is believed to be the first to implement the functionality on a large scale. "Technologies like Vizibility's Mobile Business Card can help our agents get more opportunities to share their listings, provide mobile virtual tours and engage effortlessly with prospective home buyers," said Dane Ellison, CEO of RE/MAX Regional Services. "By making it a little easier to close sales, we're making it a lot easier for our RE/MAX agents to be more successful."